Ah Richmond! You beautiful, inconsistent, never know what you are going to get race! For those that have never raced it, Richmond Road Race is put on each January and never has the same weather twice. It’s a running joke that we love to start talking about in early December. But despite this, Richmond is a top notch small race with a big feel. For starters, they have the local high school opened up for us. This means full access to cafeteria tables, change rooms, showers, bathrooms and ample space for everyone. It provides a very quick way to get out of the elements once you are done racing. After the race, we have an awesome lunch with warm soup, buns, fruit and a drink. The cost of the race is probably one of the cheapest around and the prizes excellent! For a race gift, last year a Toque (that I still wear) and this year running mitts! I cannot say enough good about Joe Duvall and his crew that put this race on! This year saw another interesting year. The weather had warmed and it had been raining . Unbelievable considering 4 days before that we had cold weather and snow! It was about 2 degrees and foggy, so overheating was a real possibility and like the day before at the snow shoe race, I stripped down as far as I could go. This was an interesting one, I had no idea what to expect because I had done the Somerstown snow race just the day before. I was a little tired and tight from that, so I really went into this race willing to take whatever my legs gave me. I decided early on, that I was going to go out as per normal and then fade as I needed to. I went for my normal 2K warmup run and felt pretty good. I was watching my heart rate for signs of fatigue and didn’t see any real issues. Once the legs got blood flowing, they seemed to loosen off and I actually caught my first glimpse of possibility. It’s no secret I have been chasing the 40 minute barrier on a 10K for the better part of a year, so in the back of mind…I started switching from whatever I could get, to what I wanted to get. I lined up beside my friend Graham Ross. Graham is a great athlete and a bit of a mentor to me. We do tend to work really well together in a race because although we do compete, we don’t mind sharing the load as we move through the race. The gun went off ( or bullhorn anyway ) and we started out. After the first KM, I felt pretty good and the pace was staying around 3:50 min/km mark. I decided to stick there and Graham had the same idea. We were pretty much side by side as we turned out the highway. At this point, my focus was actually less on my pace (and who was beside me) and more on my cadence. I’ve been trying very hard to boost my cadence at the advice of two physiotherapists. ( Shannon @ Podium and Francine at PSI ) So, in my ear, the recorded sound of a metronome chimed off a 180 step cadence. It’s not easy unlearning bad habits and relearning good ones, but it is needed to address some of the issues I have been having with my silly ankle. We turned down the “dodgiest” part of the race which is a dirt road that was slightly ice covered and pocked with holes. I become acutely aware of my surrounding and was very cautious about my ankle. Stepping in any of these holes could set me back months and I was a little timid. This was the first time I have ran without my brace in probably a month and could just see turning my ankle again. Soon enough, we turned off the dirt road and hit the highway again. Although wet, it was smooth sailing with just the fog to greet us. We rolled through the 5K split at 19:40 and I called it out to Graham. I am not sure what he said…but he might have mumbled something about “shutting up”…or “thank you”. At that point, it seemed a real possibility that we could hang on and break the 40 mark. Right around 7-8 K, my bad habits jumped out and and I felt myself sink back into my familiar over stride and lower cadence. I tried like hell to get it back, but gave up and just allowed myself to finish the race. Graham and I continued to run beside each other up until the 8K mark when the road started banking. He was on the lower portion of the road and I ran on the higher side. It was here a small gap opened. He later explained that he tried to get up a little higher with me, but in doing so, allowed a gap to open up. Seconds count at the Olympics, but amongst friends they mean nothing in my opinion. Both of us of came in under 40 minutes (quite safely) and far better than the previous year! Final Time 39:26 , 11th OA and 3rd in my age Category. 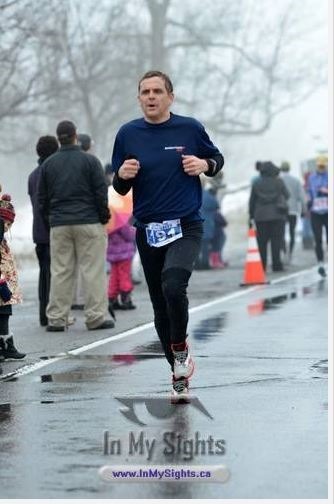 Previous Article Somerstown Snowshoe Race Report January 13th, 2013. Next Article Lance Armstrong never existed.